L.A. Noire taskmaster Brendan McNamara's next game is called Whore of the Orient and is set to be produced alongside a second KMM game based on a man named Max. 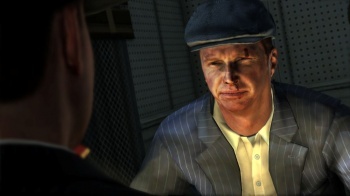 Things probably didn't go quite as planned for Brendan McNamara following the release of L.A. Noire. Despite a solid critical and commercial reception, Team Bondi collapsed almost immediately after its launch and McNamara found himself the target of some pretty harsh accusations over his leadership and management style. But he landed on his feet at KMM, the Australian studio best known for the Happy Feet films, and now the name of his new project has been revealed to the world as Whore of the Orient. Intriguing, no? And that's not the only thing KMM has in mind for its developers. A game based on Mad Max 4: Fury Road is also in the works, which Mad Max creator George Miller decided to do "after years of resisting the impulse" because there's just too much money on the table these days to ignore. "With the government's support we can immediately go forward with two games," KMM co-founder Doug Mitchell told the Financial Review. "It's not immediately obvious but the potential in the video games sector is massive. Just from the statistics people are showing me, it's a $60 billion industry fast-tracking towards $90 billion. And it's not dominated by any particular country." "People are drifting to game acquisition because of the budgets. The cost of a film may be $170 million - twice that to market it - whereas the basic cost of making a game might be 10 per cent of that. Look at L.A. Noire, they sold about three million units in a week, about $135 million net revenue, off a cost base which was infinitely lower than even your average low-budget film." Nothing else is known about McNamara's new game at this point, but he set the bar awfully high in an interview with Eurogamer earlier this month. "It's pretty interesting. It's one of the great untold stories of the twentieth century," he said. "So I think it'll be good."